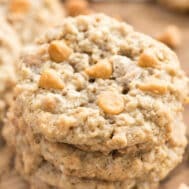 These Oatmeal Scotchies are a simple and easy oatmeal cookie full of butterscotch chips! Preheat oven to 350°. Line your baking sheets with parchment paper or silpat liners. Mix flour, baking soda, cinnamon, and salt in a medium bowl. Set aside. In the bowl of an electric mixer fitted with the paddle attachment, beat the butter and sugars until creamy. Add the eggs and vanilla and beat well. Add the dry ingredients and mix until combined. Stir in the oats and butterscotch chips. Drop by tablespoonfuls onto your prepared baking sheets. I like to use a 2 tablespoon sized ice cream scoop for this so the cookies will all be the same size. Bake 10-12 minutes. Cool five minutes and then remove from pan to cool completely.